What do you do when you’ve had enough? When life gets busy and you lose your mojo? 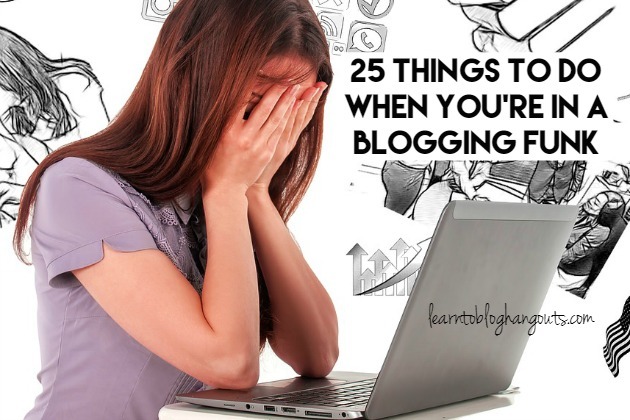 Here are 25 Things to Do When You’re in a Blogging Funk. Kelli Miller and Crystal Lopez have been blogging for a long time. 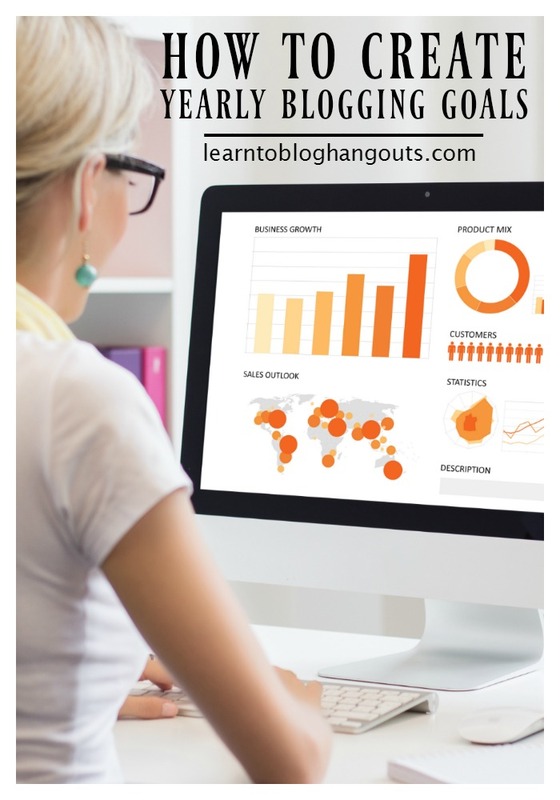 And, we’ve been coming to you week after week with #LearntoBlog topics for 52 weeks now. The reality is, lives get busy and sometimes mojo falls. Sometimes we just need a good blogging chat. For two weeks my blog received zero of my attention, our life was insane and there was nothing I could do to control it. 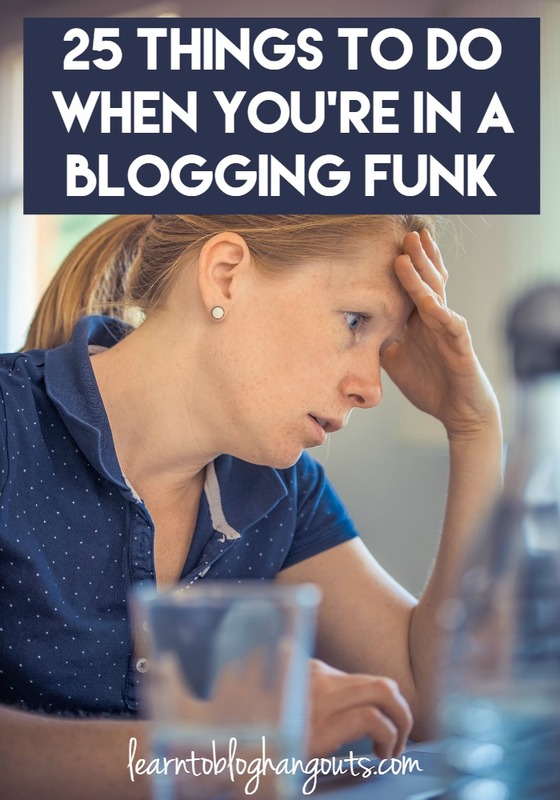 For a few months someone (whose name might start with Kelli) has been in a blogging funk. We’re gonna talk this out. We have always promised to keep it real and that is just what we plan to do this week. It will be a little like Dr. Phil. You in? Understand that everyone goes through this. Stop comparing yourself (and your struggles) to anyone else. Accept that wearing multiple hats is tiring. Depend on your Tribe for promoting your content, being there to listen, and being there to understand your struggles. Repin your source feed in Pinterest (Example: https://www.pinterest.com/source/learntobloghangouts.com). Depend on a supportive spouse (and family). Watch this video. Reduce stuff on your phone (email, Must Have WordPress Plugins, social media apps, etc.). Stick to a work schedule (it will help you focus and prioritize your tasks). Do what feels natural to you (it may or may not be 9-5). Take advantage of the time you have with your family to connect. Reduce the number of times you check email, etc. Set times and walk away. Use a timer for focused work. Don’t get sucked into social media. Work, as much as possible, on your blog when your kids are occupied or sleep (that way you won’t feel like you’re trying to be in two places at once). Realize when you’re blog is taking over your life (working more than usual, kids fighting, fighting with spouse, you’re grumpy, etc.) and do something about it. Get dressed. If you work from home, get up, take a shower, and get dressed every day to work. Take some time every day to decompress. Run away. After dinner and before bed, “run away,” even if that means locking yourself in the bathroom and/or taking a hot bath or shower. Get out of the house for 30 minutes alone every day if you can (grocery run, grab a coffee, take a walk, go to the library, etc.). Be content with who you are and what you are doing. Do your best and make the best of your situation. Understand that everything isn’t going to go smooth at the same time (i.e. when things are going well at work, you may be spending extra time on work projects, and your house’s cleanliness may suffer). Decide what’s important to you. You are not going to be a great wife, mom, and blogger, always every day. Can you fit all three of those roles into every day? What can you take time away from to put into one of those areas? Know what your hot spots are. Is it the kitchen sink needs to be clean? Is it your desk needs to be clean? Does the living room need to be clean? What makes you feel like everything is under control?